Fundamentals: Russel 2000 and also most index are bearish long term. 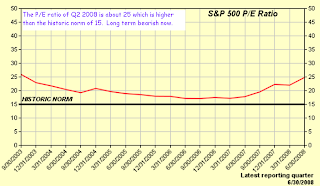 Can be visualized that current P/E trend as of second quarter of 2008 is higher compared to historic P/E average of 15. 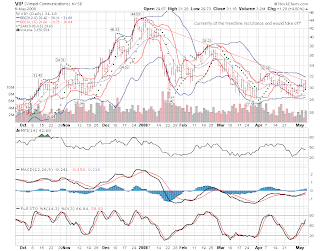 Technicals: Bounced off from recent low of $63.09 on Sep 2, 2008 compared to $62.24 on August 15, 2008. Forming a MACD divergence and heading up to MA(40) weekly/ MA(200) daily in image below. Also, on August 18, 2008 formed a Bullish Continuation Wedge pattern with potential target of $88.00 within next 60 days. Other comments: Historically September is a bad month for stocks which is in favor for this ETF. Fundamentals: Ann. 5 Yr. Hist. EPS Growth 42.25; P/S 0.53. Considering Analysts 5 year average Earnings Growth Rate of 8.33% and applying discount rate of 15% the Intrinsic Value is $32.91 which indicates that this is Undervalued. Also, CCK's 1 year cash flow and revenue growth are 21.05% and 9.42% higher than the industry average, which can indicate that the company is managing its sales and costs better than its competitors are. 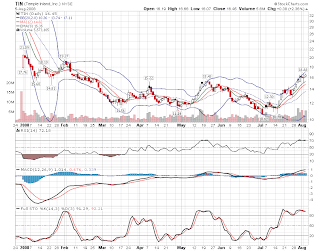 Technicals: Bounced off from the MA(40) weekly. On August 20, 2008 formed a Bullish Symmetrical Continuation Triangle pattern as below. Other comments: Over the next 1-2 months, the value stocks will be in favor and also mid-cap stocks will be in favor. Fundamentals: ROE 76.30% which is highest in the sector with dividend yield of 2.50%. TIN's 1 year earnings growth is 138.49% higher than the industry average. TIN's price/earnings (P/E)and price/sales (P/S) ratio are 95.50% and 88.40% lower than the industry average, which indicates that investors are buying TIN's revenue at a significant discount. 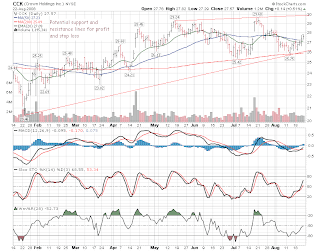 Technicals:MA(200) daily is $19.26 and MA(40) week is $17.95. 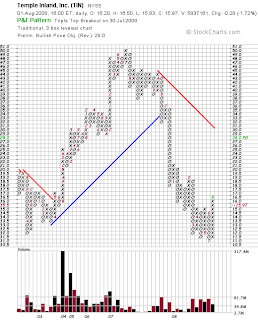 P&F Pattern 'Triple Top Breakout Bullish' as of July 30, 2008 with target as $28. Also, 'Megaphone Bottom' pattern formed on July 30, 2008 with target of $20.00. Image below shows uptrend and P&F chart. Other comments: Paper and Paper Products sector is doing well recently. Fundamentals: LDK's P/E ratio is 72.84% lower than the industry average and P/S ratio is 84.58% lower than the industry average; which indicates that investors are buying LDK's earnings and revenue at a significant discount. LDK's 1 year ROE is 270.35% higher than the industry average. Technicals: MA(50) moving up and about to cross MA(200). Also current price closing above MA(50) support. Attached image shows them. 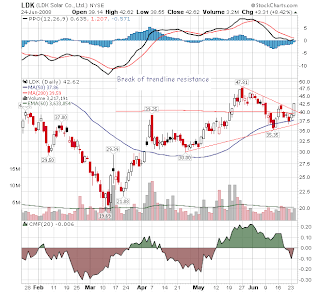 Other comments: Combination of Alternative Energy due to energy crises and China stocks. 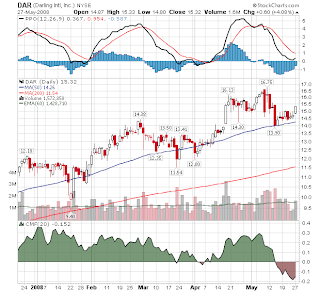 Fundamentals: DAR's total debt/equity ratio is 83.93 lower than the industry average. DAR's 1 year ROIC is 47.72% higher than the industry average, which may indicate that DAR has made very good use of its debt and equity capital. DAR's price/earnings (P/E) ratio is 83.07% lower than the industry average. Technicals: MA(50) and MA(200) are having good upward trend. Also current price is close to MA(50) support. Attached image shows them. Fundamentals: DHI's ROE has dipped below the Residential Construction industry's average ROE over the last five years. DHI's 1 year ROA is 35.67% lower than the industry average, which may indicate that DHI has not used assets as successfully as its competitors have. DHI's long-term debt/shareholder's equity ratio has risen above the Residential Construction industry's average within the last five years. DHI's net profit margins have fallen below the Residential Construction industry's average over the last five years. Technicals: Two Bearish Pattern Recognition as of Close May 09, 2008 as: 'Continuation Wedge (Bearish)' and 'Double Top (Bearish)' with target of $7.75 and $12.20 respectively. Also note that trendline on weekly chart has been broken with PPO bearish divergence. Attached image shows them. Technicals: Currently MA(50)>MA(200) and they are in very close to each other even though the trend of MA(50) is down. 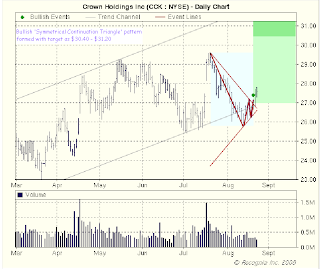 Three Bullish patterns are found: 'Continuation Wedge (Bullish)' as of close on May 2, 2008 with potential target as $39. 'Diamond Bottom (Bullish)' and 'Symmetrical Continuation Triangle (Bullish)' formation as of close on 06, 2008 with potential target as $36 and $46. Attached image shows the trendline resistance. Other comments: VIP recently posted fourth-quarter and full-year 2007 results, noting that revenues exceeded $7 billion and grew at a remarkable rate of 47%. The company exhibited growth in many areas and VIP also offers a dividend yield of 0.9%, which is better than the industry average.